Manzanita branch hardscape for acid bog display with Sphagnum moss, Drosera honeydew and bog Ericaceous shrubs. Dojo Terrarium planted as Mossery with live mosses, Cupressus tree and diorama features. Illuminated with energy-efficient LED lamp. Dojo Terrarium planted as Mossery with live mosses and Capreolus deer skull. Illuminated with energy-efficient LED lamp. Dojo Terrarium planted as Mossery with live mosses, Pinus seedlings and Cervus. Illuminated with energy-efficient T5 lamps. Mexico Biotope Riparium in 120-gallon enclosure with Ruellia, Cyperus, Hymenocallis and other marginal aquatic plants. Livestock includes wild-type Poecilid and Goodeid livebearers. Dojo Terrarium with planted as woodland scene with Sequoia tree saplings, Goodyera orchids and evergreen Magnolia. 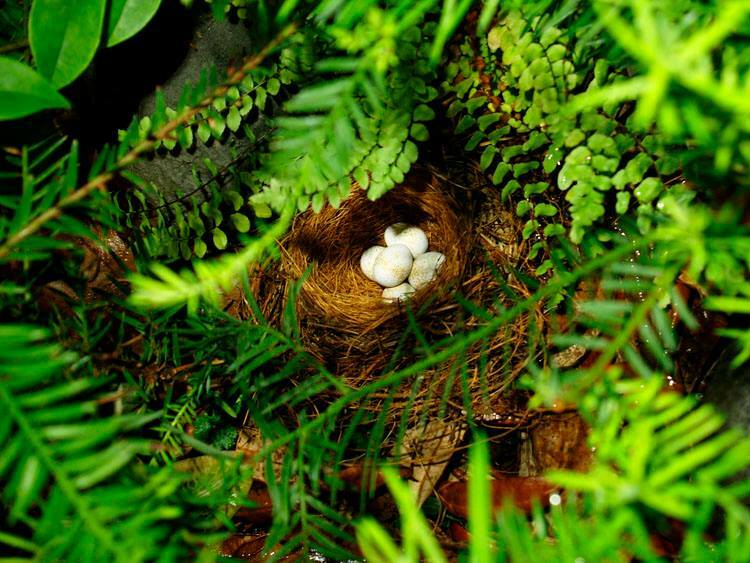 Diorama elements recreate Oreothlypis warbler nest with cast resin replica eggs. Illuminated with energy-efficient LED lamp.